You will need an epub file of your book in order to upload it to your Prolific Works Dashboard. 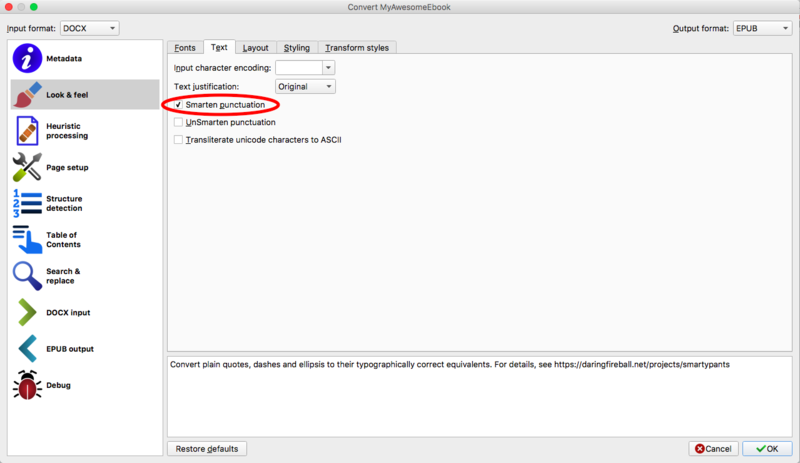 If you have a well-formatted .docx, you can follow these steps to create a well-formatted epub file. 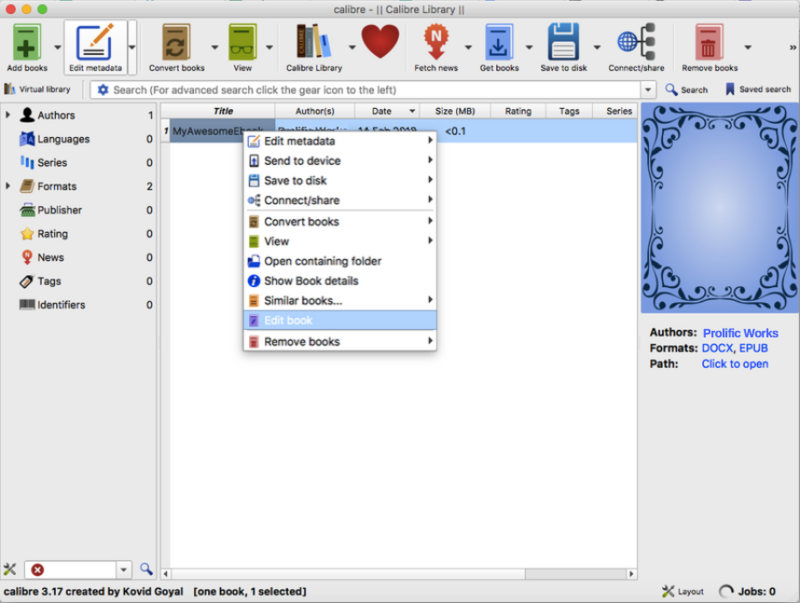 We recommend using Calibre, a powerful ebook manager and editor. It’s completely free and open-source, all thanks to its creator Kovid Goyal. If you have a .docx file, open it in Calibre. If your document’s file type is just .doc (no “x”), you’ll need to convert it since Calibre isn't compatible with that format. You can simply open a .doc file in Microsoft Word and save it as a .docx file. If you don’t have Microsoft Word available, we suggest uploading your .doc file to Google Drive. You can open it in Google Drive and then download it as a .docx file. 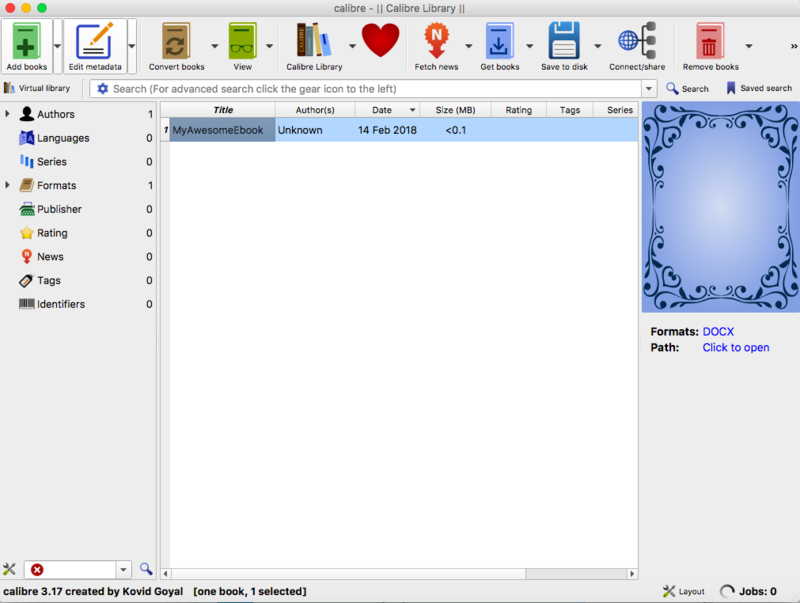 First, you'll want to edit the book's metadata so that your name and your book’s name show up when reading it on an e-reader, computer, or other device. To do this, click on your book in the main Calibre screen and then click the "Convert Books" button at the top of the app. After pressing the button, the first screen you’ll see is the Metadata section. On the right side of the screen, edit any applicable information (title, author, etc.). It’s perfectly acceptable to leave the publisher, tags, or series forms blank if you have nothing to put there. You absolutely want to fill out the title and author(s) forms, though. Add a book cover here, too: your readers will love you even more! 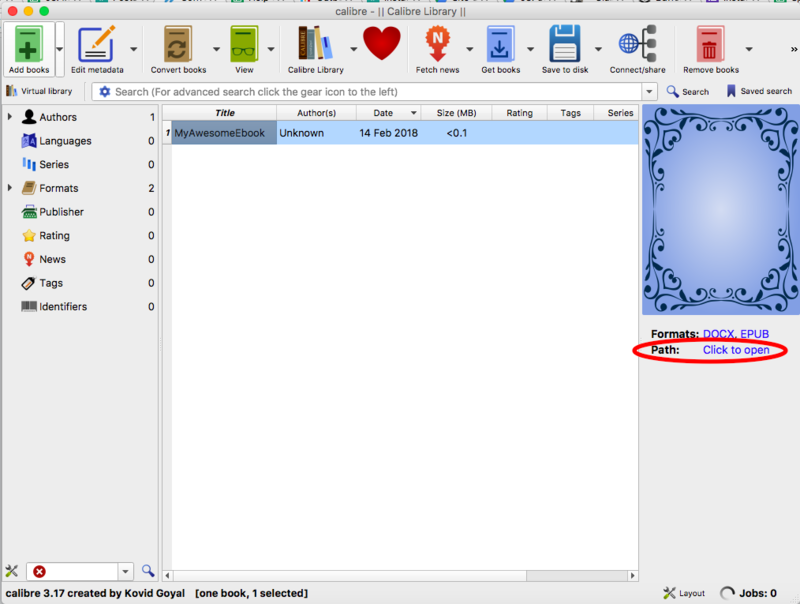 Note: when adding a book cover, click the little file icon (to the right of the box; see below) and select your book cover image file from your computer. Don’t select the "use cover from source file" option. 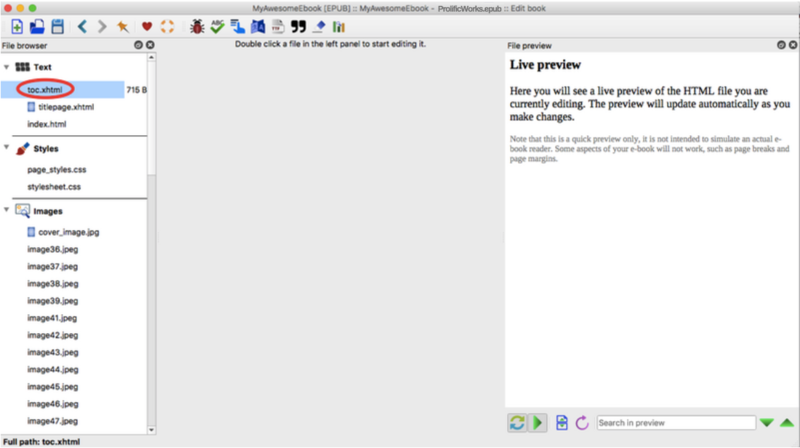 Once you’ve finished adding metadata and a book cover, click on the "Look & Feel" section on the left side of Calibre. 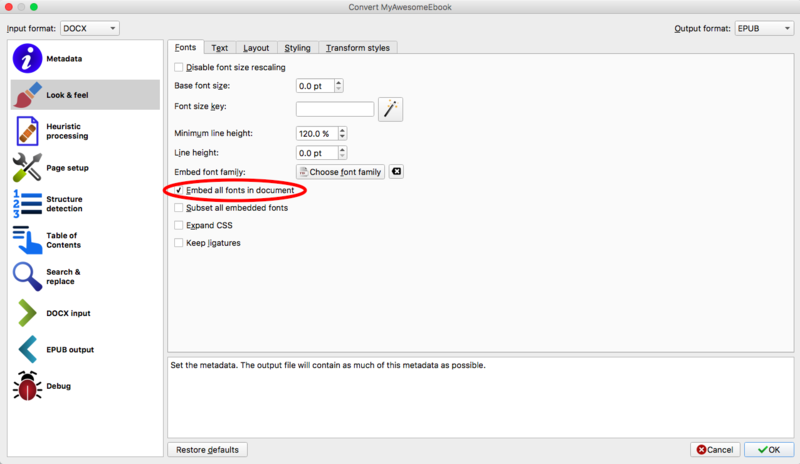 Check the box next to "Embed all fonts in this document." 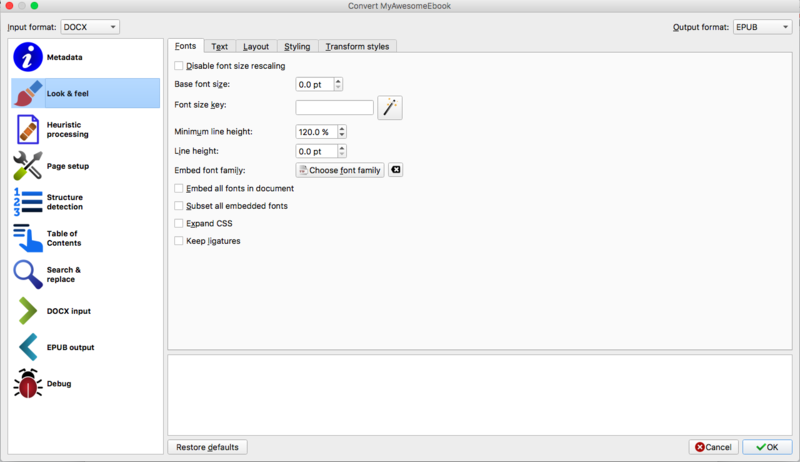 This places the font file directly in the epub so that if a reader doesn’t have Helvetica (or whatever font you use) on their computer or reader, the font will still be displayed. Next, select the "Text" tab along the top of the page. On this page, check the box next to "Smarten punctuation." This replaces the straighter quotes (that look like double apostrophes) with fancier curly quotes. This means the document is typographically correct. Click on the Page Setup section on the left side of the page. The only option you need to change here is the “Output profile” setting. Scroll down and find “Tablet” and then click on it. 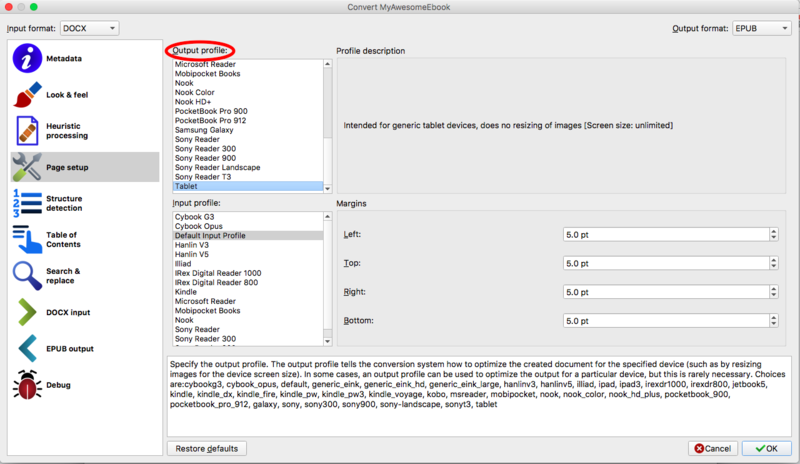 This simply makes sure that your images are not resized on different devices. If you upload a high-quality cover that looks incredible, it won’t be downsized to a lower quality. Next, click on "Structure Detection" on the left. You only need to change one option here. Check the “Remove first image" option and leave the other defaults. Next, click the “OK” button at the bottom-right of the Calibre app to start converting your .docx file to an epub. Once Calibre finishes converting, you’ll see a link below the cover image that says “Path: Click to open.” Click it, and the folder where your new ebook was created should appear. You can always view the ebook in Calibre, but I prefer to view it in either iBooks on a Mac, or Icecream on a Windows PC. If you’re happy with the results, then start building an empire on Instafreebie! If you’d like to go the extra mile and add a fancy table of contents, though, then read on. 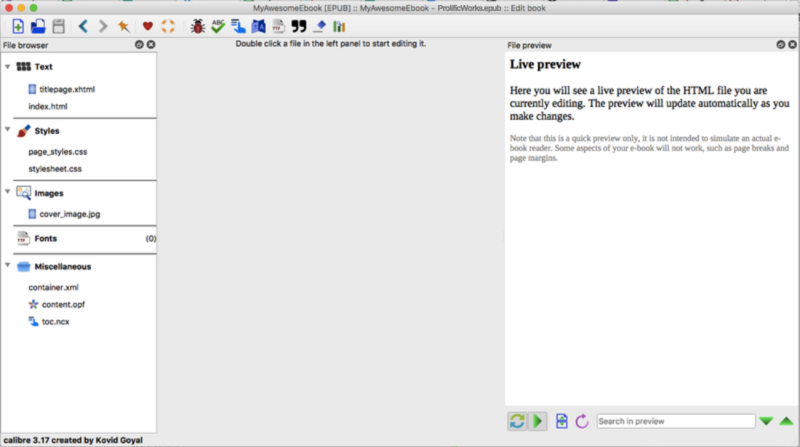 In the main Calibre window, right click on your book and select "Edit Book." You will be taken to a new page. If you look on the left side of this "Edit Book" page, you’ll see Calibre’s file browser. This shows all the files that make up an epub. If you take a closer look, every chapter is just an HTML file. Epubs are really zip files that house HTML and CSS files. You can think of an epub ebook as a mini webpage . At the very top of your screen, you'll have a toolbar of little icons. Mouse over these and find "Edit Table of Contents," and click on it. You’ll see a new screen that asks how you’d like to form your table of contents. 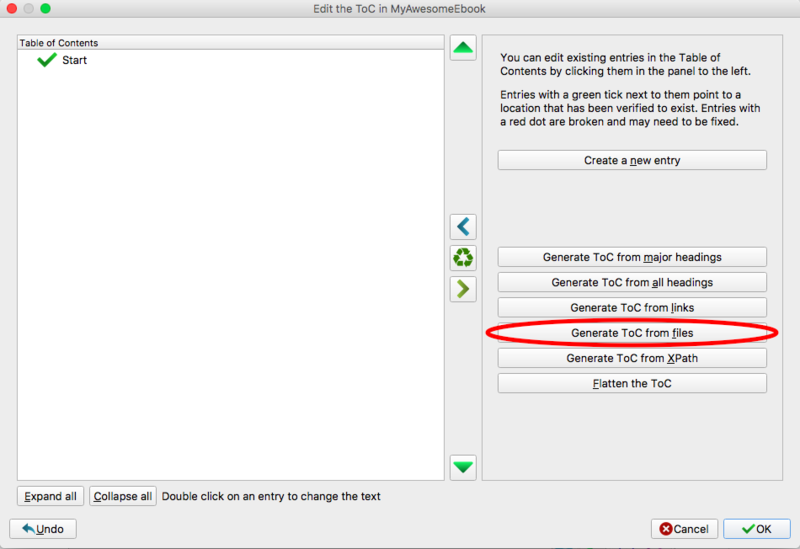 Click on the button labeled "Generate ToC from files." 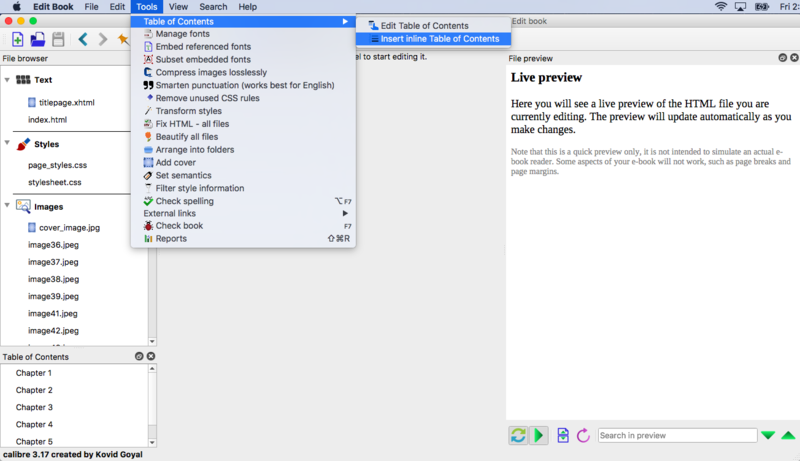 Once you click that option, you’ll see that Calibre wants to add every single file to the table of contents. 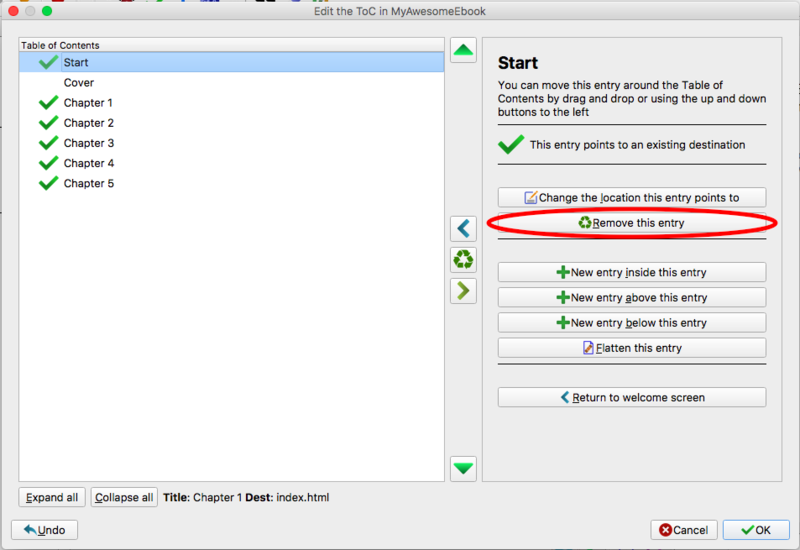 We don’t need anything before Chapter One, so click on each file (Start, Cover, etc.,) before Chapter 1 and then click the "Remove this entry” button on the right. Click “OK” when you’re finished. Now that the table of contents is actually added to your book, place it in the right spot. The file browser on the lower right side shows you where the files are positioned in your book. By default, Calibre places the table of contents at the beginning, before your cover. You can simply click and drag your table of contents (“toc. xhtml ” in the file browser) to the proper location. A table of contents should be placed after your copyright and dedication pages, but before your acknowledgments page. When you double-click a file in the Calibre file browser, you’ll see the HTML used, as well as a preview of what it looks like when viewing it in an e-reader. If you have the previously listed pages and need to find out which files they are in, just double-click the first few files to see their contents in the preview panel. 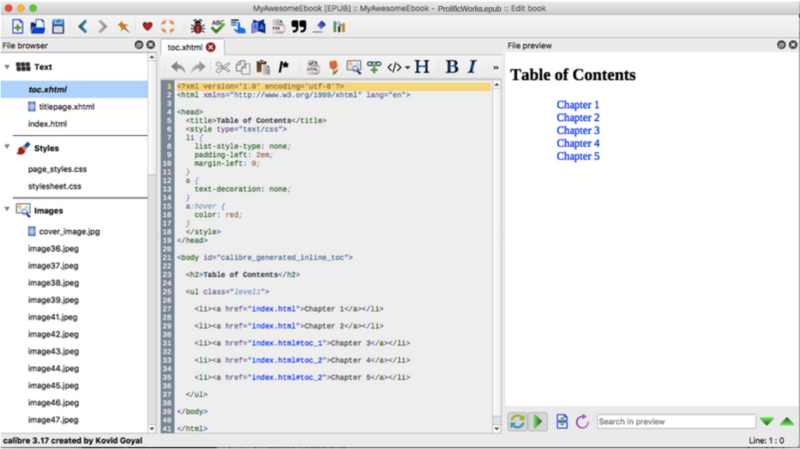 If you don’t have any of those files in your ebook, place your table of contents after the book’s title page. Make sure to save your changes. Click the “File” menu at the very top of your computer screen and then select "Save." 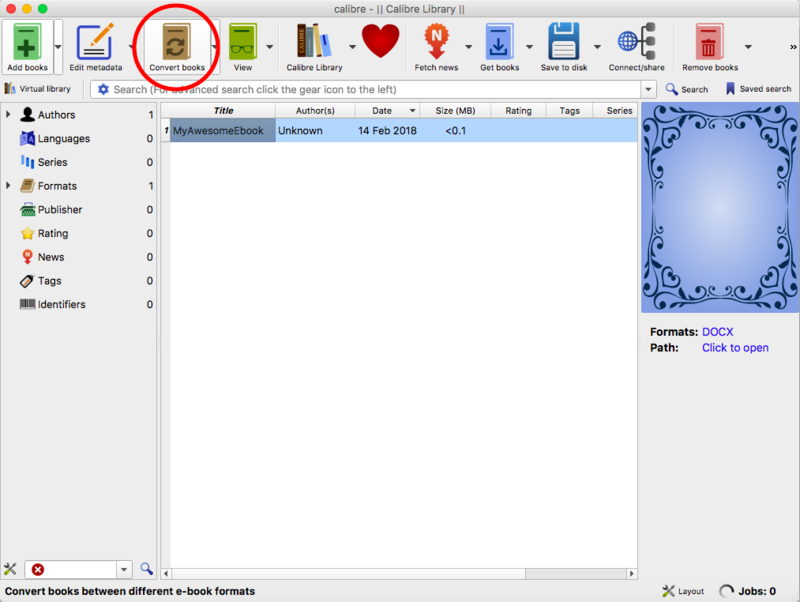 You can now close the "Edit Book” window and navigate to your epub (which is always found by clicking the “Click to open” link when your ebook is selected in Calibre’s main window). 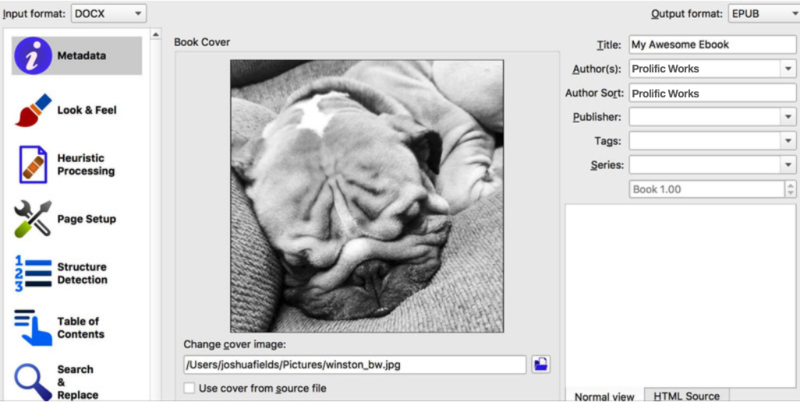 Inspect your new epub file in your reading app of choice, make sure it looks good, and make sure the links in the table of contents actually work!